First off, very happy to be joining Doctor Squee on a new adventure not only talking Doctor WHO on his podcast, Gallifrey Stands Podcast, but enjoying the new adventures of the Doctor in Big Finish audios. This is not my first time listening and enjoying the extended life spans of all the Big Finish audios, but now, you get to hear my take on them. Having said that, here’s my first go with the Fifth Doctor’s audio, ‘Serpent in the Silver Mask’. I’m not new to the Fifth Doctor’s audio adventures, but I am very new to the Fifth Doctor’s Companion team on audio, and I must say, it’s good to hear the team again. I must confess, people had warned me in advanced that Matthew Waterhouse is not the sprite, young Adric he used to be and it was rather a challenge for the first time to hear Waterhouse step up to the plate and take on his younger self. For me, I just had to go with it and accept it; at least the writing paid homage to young Adric and his quirks that made Adric. So, once I got past that, the rest was easy. “Serpent in the Silver Mask” story harkens back to the classic series of the Fifth Doctor landing TARDIS, gets himself into trouble, tells his companions not to wonder off, companions wonder off, get into trouble, he tries to bail them out… and you get the idea. This episode could have easily fit into the classic series should it have been televised. I love the feeling of a story riding shot-gun to that of an Agatha Christie meets Sherlock Holmes. Janet and Sarah picked up the ball of their characters as I remember them from way back when. Overall, I did enjoy this episode, as much as I did the Fifth Doctor’s series on television. 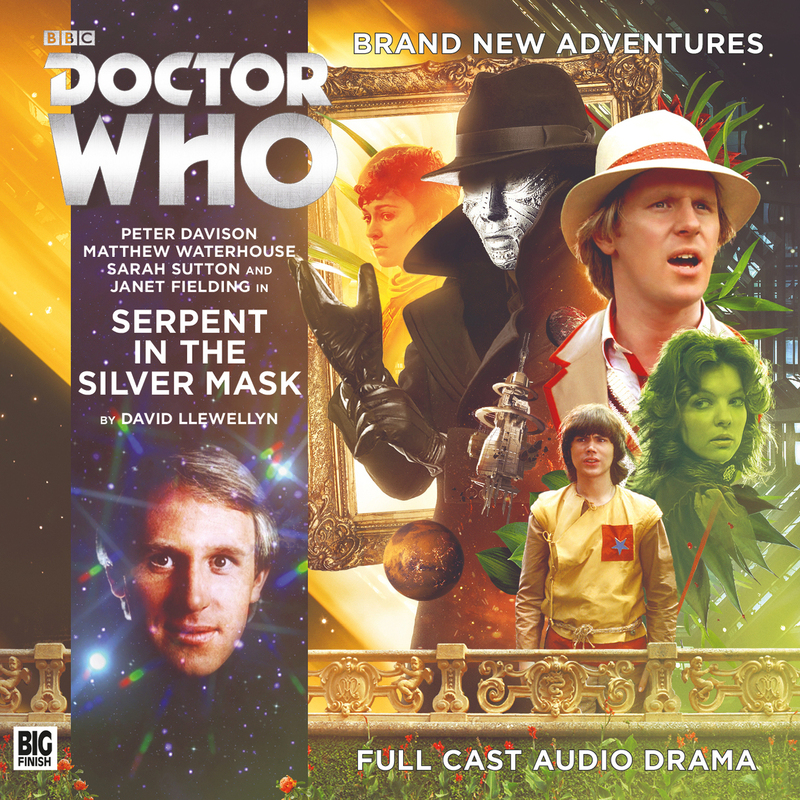 In fact, if you wanted a best representation of the Fifth Doctor’s tenure for the most part on audio, “Serpent in the Silver Mask,” is the best representation of that.